Betfred promo code - Huge new customer offer available NOW! Opened as a single shop in 1967 by co-founders Peter and Fred Done, the Betfred brand has grown into a multi-billion-pound company. It is a real giant on both the high-street and online, a modern success story of British business. In 2011, they boosted their portfolio when buying out the Tote. There has been no luck involved either, in this review we explain why. In order to tempt you into joining up and trying the site for yourself, Betfred run a solid new customer offer bonus: Bet £10, Get £30 in free bets + 30 free spins. Simple, fair and to the point – it sums up the firm perfectly. This allows you to open an account with a manageable first deposit, and then have a good look around the site with the bonus. You can have a proper look around and try out different matches, offers and markets. It’s their way of letting you dip your toe in the water – but it could pay off and here’s why. Lets have a look at the sportsbook first, and we start with Betfred’s bread and butter – the beautiful game. Football is what they’re probably best known for, and their football offer is a screamer. 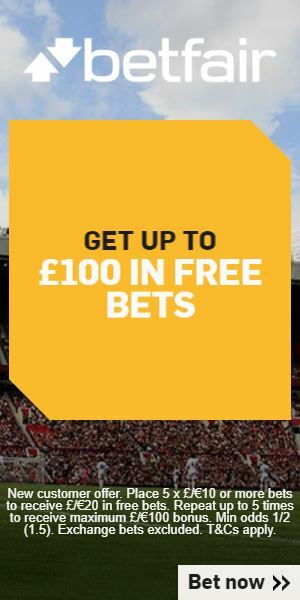 All you have to do here is place a first goal scorer bet on a match, to the value of £10, with odds of 4/1 or greater, and you have an interest right the way through the 90 minutes. For example, if he scores first you’ll get the single win, in this case £40, if the same man then goes and gets a double, Betfred will x2 your odds, boosting it to an £80 win, and if the hero of the hour goes and bags a hat-trick, then you’ll deserve every bit of the x3 odds that’s coming your way, £120 in this instance. An excellent idea for keeping you glued to the screen. Betfred’s Cash Drop feature is also well worth a mention, as it’s almost too good to be true. Celebrating their birthday, at 10am every Saturday they will randomly drop 50x £50 cash bundles in customer’s accounts. Who’s? Well, it could be anyone, that’s the magic of it, just by having an account you’re automatically in the running for a cash windfall. It’s a case of trick or treat though, as every hour after 10am they will then randomly remove 10 of the prizes, until all have been removed or claimed. Kind, but a bit on the cruel side too, especially if you hadn’t noticed. There really is everything you’d want to see if you were an avid backer of British and Irish horse racing. Starting with best odds guaranteed, you’re ensured the best price about a selection, even if the SP is bigger than the odds taken at the time of placing your bet. If your pick ends second behind the SP favourite, you’ll get your losing stakes returned up to the value of £25. If you prefer a punt on the popular multiples, Super Bonus Races is for you. Pick an all correct Lucky 15/31/63, Yankee, Canadian or Heinz from their selected Super Plus races and you’ll get a bonus on your winnings. They’ll also do the same if you end with only one winner on those multiples. Betfred have been active sponsors and supporters of Super League Rugby in recent years, and it shows. If you’re having a bet on any game there, it really does pay to do it with the British firm. Similar to that amazing first goal scorer bet in the football, if your first try scorer gets a second and third, your returns multiply. It’s worth mentioning the offer is only available on live TV matches. Is there a Betfred promo code for existing customers? No code required no, but its worth reading the sections above on all the individual sports they cover. Each sport has its own bespoke bonuses and incentives for Betfred existing customers, so you’ll be rewarded simply for continuing to use them. Betfred famously have also paid out early to their loyal punters on a number of occasions, even when the selection turned out not to be a winner! Criteria required to trigger the bonus. Please see Betfred for full details. We believe the best way to get a true idea of the mobile site is to read what genuine, every day users make of it, and for that we’ve skimmed over the reviews section in the apps store. It’s a resounding yes from Joe public too, with commenters falling over themselves to give this app the thumbs up. Some of the most recent reviews call it excellent, easy to use and great on prices. One thing that seems to be holding back the five stars however is speed. Many users freely admit they would give this one full marks if only it was a little quicker. Speed is, without doubt, one of the main aims of a mobile betting app, but this one gets pass marks without much fuss, and with a handy, easy to follow lay-out, any issues you may encounter wouldn’t spoil your enjoyment of having a bet on the go. You’re not at the top end of the game for so long without earning a reputation as a firm you can trust, and that’s what we get with Betfred. A very British betting company, which relies on old fashioned ethics and customer services, you don’t have to think twice about security when depositing or withdrawing using your bank cards. Operating a high-end encryption service, you’re in safe hands. There’s a number of ways to top up your account, or get your winnings. Betfred deal in a number of payment methods, including debit/credit cards, Neteller, Paypal and bank transfer. Most have a minimum of £5 deposit. What goes as a real plus point is the ability to top up your online account in any Betfred betting office. Simply pop in store, and the staff behind the counter can top up or pay out your account there and then. No messing about, cash in the hand when it’s needed. You can’t go wrong. Betfred customer service – how will you be treated? The customer service channels are standard, but what’s special about them is their team. A group of hard working, knowledgeable, sports fans, you can rest assured they will deal with any queries or questions in a professional manner. There’s a number of ways to get in touch too. Through their live chat feature, which puts you in touch with a member of their team on your desktop, allowing you to type up your issue and have it resolved in the quickest possible time. You can also call or even email the staff, and we’ve found that they are prompt at firing back. The key information around this sign up offer can be found in the info box just above. This explains the main things to be aware of when you join Betfred – these are intended to make you aware of the most important terms only. The full terms and conditions must be confirmed on the Betfred site before you proceed. We have taken the decision NOT to republish them here as they are regularly subject to change and we want to ensure you have seen the latest version before registering.